Carlton Ware introduced the embossed range of 'Basket' in 1939 in either green or yellow colourways. This range of tableware has a design of pretty Spring flowers that are very realistic in appearance. They resemble varieties of Primula in full bloom. A bell-shaped flower, probably a Fritillary, usually accompanies the blooms. Each Dish has an embossed design representing a basket-style weave giving a rope or twine effect. This is replicated in the handle. 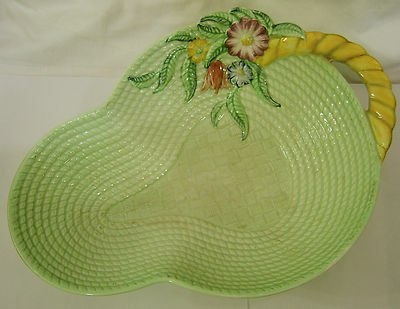 This Serving Dish measures 11 inches (2 8 cms) in length with a maximum width of almost 7.75 inches (20 cms). The condition is excellent with just a very faint trace of discolouring in the well of the bowl. There is some evidence of light crazing underside. It is backstamped appropriately, showing it to be an Australian registered design with the impressed shape number 1922/2.